While our UPLIFT desks can support any desktop that is at least 22.75" deep, the standard desk foot is over 27" deep, meaning that the feet may stick out and show on shallower desktops. If you plan on moving your UPLIFT Sit-Stand desk base to a smaller top, these 24" feet will work for you. For a standard foot, see the UPLIFT Desk Standard Foot for T-frame Desks listing. 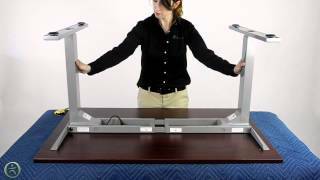 The UPLIFT T-Frame Desk Short Foot comes in your choice of black, gray or white to match your UPLIFT T-Frame Desk. $35.00 List Price: $50.00* The list price is the same as the MSRP (Manufacturer's Suggested Retail Price). It may not necessarily be the price at which the product is sold.